Today’s agenda includes the Tromsø Skyrace–a Skyrunner World Series event–and the PizTriVertikal–a World Mountain Running Association event–as well as a look at next weekend’s big Sierre-Zinal showdown. Sit tight and read all about it! It’s very, very technical. That’s a fair description of the Tromsø Skyrace. The event includes multiple races, but the 57k distance was the marquee race, and was again part of the Skyrunner World Series. 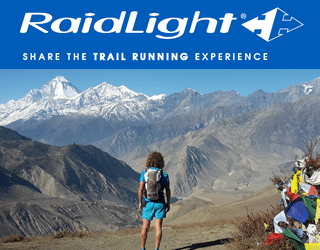 Thanks to Raidlight for sponsoring this edition of TWIR! Hillary Gerardi (USA) earned a big win and a new course record in 8:14. Although an American, Gerardi lives in Europe and doesn’t typically get the stateside acclaim she’s due. This win though adds to a number of mountain successes in recent years. 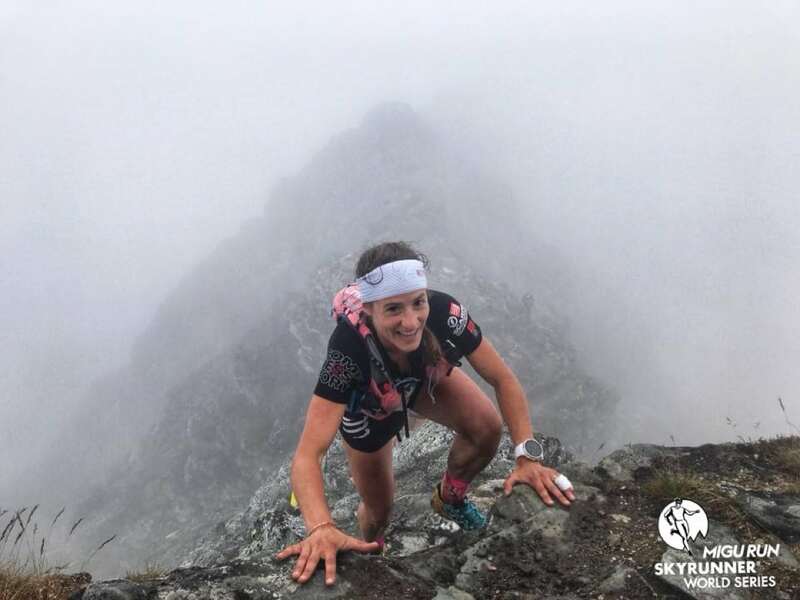 Gerardi’s winning form pushed frequent Skyrunning winner Ragna Debats (Netherlands) to second, for the second year in a row. Debats finished in 8:27, two minutes back of her own 2017 run. Brittany Peterson (USA) was third in 8:40. There was a large gap to the next group, and Henriette Albon (U.K.) and Sophie Andrey (Switzerland) were fourth and fifth in 9:44 and 9:59, respectively. Victory in the 32k race and the Vertical K went to Arja Arnesen (Norway) and Therese Sjursen (Norway) in 3:26 and 48:04. This is the kind of terrain that Jonathan Albon (U.K.) excels on, and he won for the third time in the last four years. This year’s 7:04 finish was three minutes back of his 2017 run, but he was well clear of this year’s field. Pere Aurell (Spain) and Andy Symonds (U.K.) were second and third in 7:28 and 7:32, and Dmitry Mityaev (Russia) and Cody Lind (USA) were fourth and fifth in 7:36 and 7:37. 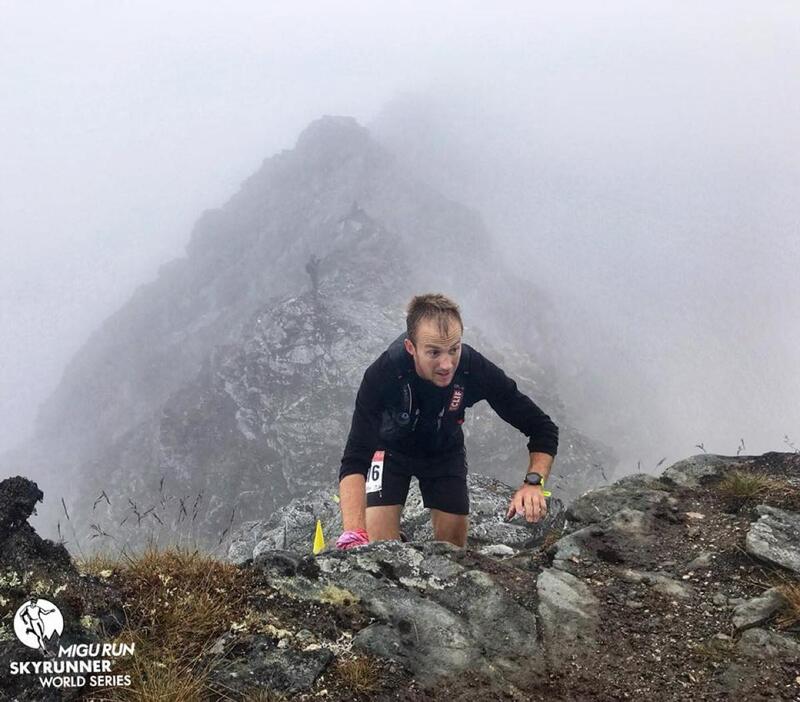 Eirik Haugsnes (Norway) won both the accompanying 32k race and the Vertical K.
The next Skyrunner World Series race is the August 25 Matterhorns Ultraks contest in Switzerland. Just weeks after winning Ronda del Cims in Andorra, Darcy Piceu returned to racing and won the Angeles Crest 100 Mile in 22:17. Don’t forget that she won the HURT 100 Mile earlier this year too. It’s been a big year already. Katie Asmuth and Teresa Kaiser were second and third in 22:49 and 23:29, respectively. The ladies placed three runners inside the overall top 10. 2017 fourth-place finisher Rene Dorantes moved up and won the men’s race in 19:23. Jake Jackson was second in 19:36, and Benjamin Atkins was third in 20:28. Italy’s PizTriVertikal was the World Mountain Running Association’s second World Cup race. It is a true Vertical K, gaining 1,000 meters over just 3.5k. Uphill ace Andrea Mayr (Austria) set a new course record in 38:11. Valentina Belotti (Italy) was second in 42:49, and Sarah McCormack (Ireland) was third in 43:26. Francesco Puppi (Italy) won a close one against Hannes Perkmann (Italy) and Timothy Kirui (Kenya). The trio finished in 34:51, 35:15, and 35:45, respectively. The next World Mountain Running Association World Cup contest is next weekend’s Sierre-Zinal race in Switzerland. The Glacier 3000 Run in Switzerland gains 7,000 feet of elevation over 26k, and prize money–1,000 Swiss Francs ($1,005) to the winner–was on the line. Michela Segalada, Petra Eggenschwiler, and Nadja Kessler earned women’s podium finishes with 2:46, 2:55, and 3:06 marks. Just 32 seconds separated the top-three men. Tefara Mekonen escaped his chasers for a 2:26 win. 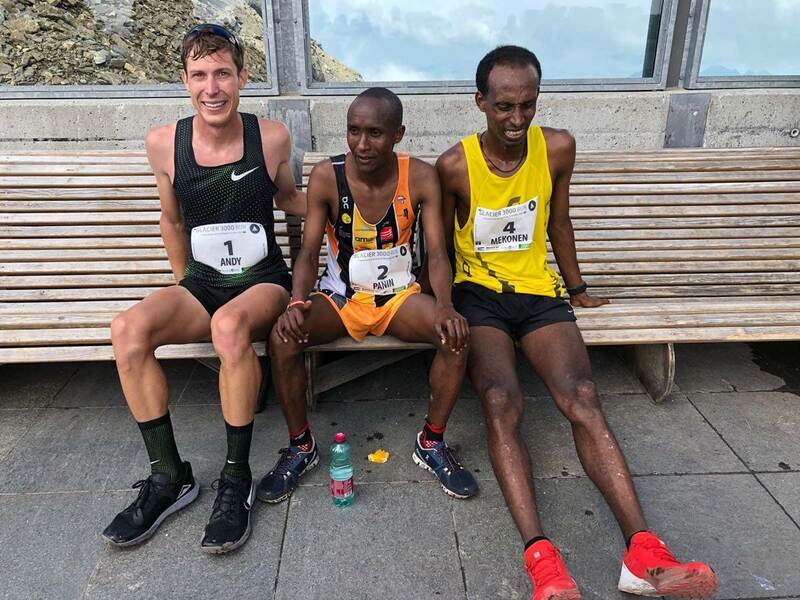 Robert Surum Panin (Kenya) and a honeymooning Andy Wacker (USA) were second and third, both in 2:27. Full results. The summer edition of the twice-a-year Beast of Burden 100 Mile race in New York had Gina Schneider and Adam Russell as its winners in 19:40 and 19:48. That’s right, women’s winner Schneider was also the overall winner. Full results (when available). Wins at Wyoming’s El Vaquero Loco 50k went to Erin Hill and Trevor Fuchs in 6:26 and 5:29. Full results. Christi Richards and Jayden Dalke won this year’s Canadian Death Race 125k in 15:52 and 13:22. Full results. 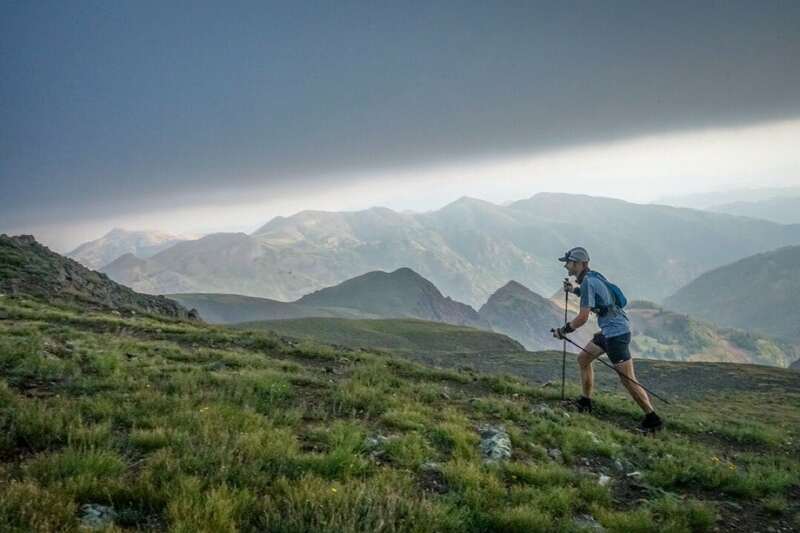 The team of Aravaipa Running took over management of the Tushar Mountain Runs this year in the little-known Utah mountain range, and offered up four race distances ranging from a half marathon up to 100k. Meghan Hicks and Eric Syrstad won the 100k event in 16:43 and 15:08, respectively. In the 70k, it was Moira Hough and Nick Coury who won in 12:00 and 9:30. Full results. 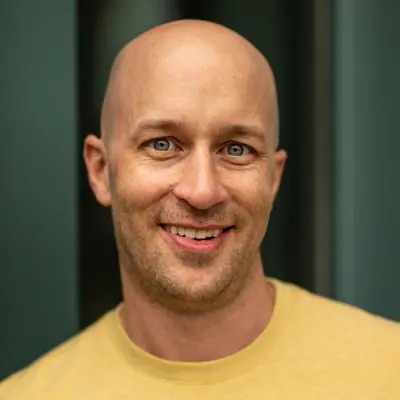 The low-key but competitive Jarmans Invitational Marathon in Virginia celebrated Rachel Bell Kelley and Matt Thompson as its winners in 5:11 and 4:27. Full results. Vermont’s Long Trail runs 273 miles from one end of the state to the other. Alyssa Godesky broke Nikki Kimball‘s six-year-old women’s supported FKT by five hours, finishing the adventure in 5 days, 2 hours, and 37 minutes. More information. 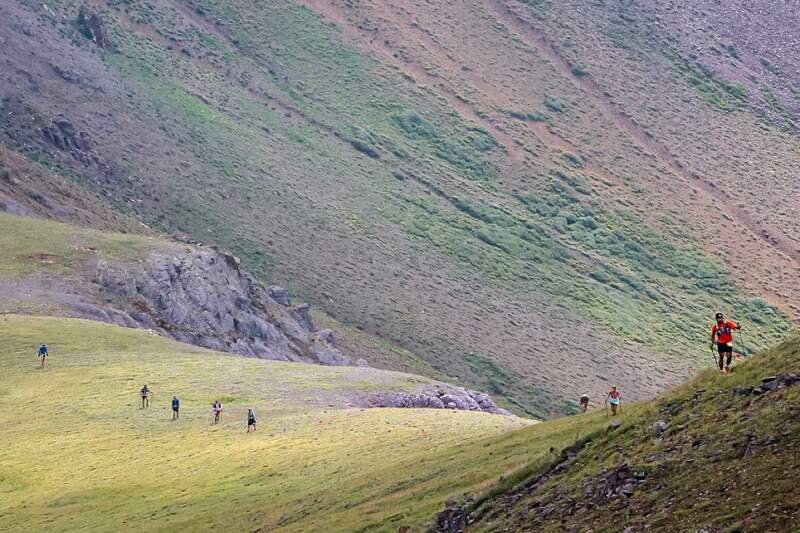 The 31k Sierre-Zinal is consistently among the world’s most competitive trail races. 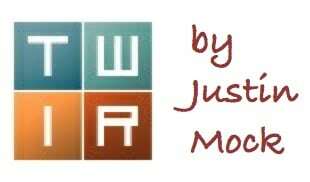 This year’s run–the 45th edition–is both a WMRA World Cup race and part of the first-year Golden Trail Series. Here are some of the runners we believe are racing. Can anyone add to the list with more known starters? This is a fascinating collection of ladies who’ve succeeded in trail and ultrarunning in very different ways, so much so that it’s difficult to pick a true favorite. Was the last time that Kilian Jornet and Joe Gray raced each other at the 2014 Sierre-Zinal where they went one-two, respectively? Got any questions for us, or any race results to add? Let’s hear about it below. Thank you! I was trying to find these results! Wow! Ryan Smith way under the old CR at High Lonesome! It will be fun to see if this race attracts more elites so we can see how low the CR can go each year. Yep, As I came back this year I knew if conditions were good, it’d be fast!! It was and I even went under CR. It’s going to be CO classic in no time! The Skyline 50K, the oldest trail 50K in the U.S., held its 37th running on Sunday. Caroline Boller and Tim Comay were the winners. Fat Dog 103 ( shortened from 120) is this weekend! One quick nitpick comment, you write “The Glacier 3000 Run in Switzerland gains 7,000 feet of elevation over 26k.” I love these recap articles, keep them coming, but keep the units of measurement consistent. I’m guessing many people, myself included, have trouble readily computing feet per kilometer. Maybe best to just keep it imperial or metric. I hear ya, noted. I struggled with that site’s translation and ended up with this. 21.1k = a half marathon = 13.1 miles. 26k – 21k = 5k = 3.1 miles. 13.1 miles + 3.1 miles = ~16 miles. Or, 26k = 5k * 5 + 1k. So 5k = 3.1 miles * 5 = 15.5 miles + 1K or 0.62 miles so ~16 miles again. Ha, crazy computations Ben! More than anything I just mean either write in feet per mile, or meters per kilometer. The author can choose either imperial or metric units, but feet per kilometer is a bit like speaking spanglish. I can’t stand cooking instruction in Imperial units and most my work is for European clients in metric. But, I just don’t want to wrap my head around elevation gain in meters. I agree keeping units consistent is important, but keep the gain in feet please. Actually I don’t care that much, you are doing a great job, I just love talking units of measure and running. That’s a crazy Sierre-Zinal field. I’m guessing the women is a combination of Mimmi Kotka, Ida Nilsson, and Ruth Croft, but don’t you dare make me pick what order. Can’t forget Hoka One One athlete and Trails & Tarmac coach, Cole Watson will also be racing in that stacked Sierre-Zinal! 2015 was the last time Jornet and Gray raced, kilian finished first and Gray was 4th. It will be interesting to watch this year as Solomon will once again be showing the whole race live! It appears Kilian has been expecting a combative race as he’s been training on flat ground for increased speed, think he wants to have this win which would give him the most wins of Sierre Zinal. And I wonder if Gray has been using the FKT he’s been doing for training for this? I don’t even want to take a guess on that women’s field, other than it’ll be a nail biter to the finish. Meghan Hicks’ win at the Tushar 100k is not to be glossed over. That course is legit tougher than hell (but stunningly scenic)! 18k vert in 62 miles, averaging around 10k above sea level on a lot of technical terrain. Congrats to Erik Syrstad (last year’s Standhope 60k wirnner) for winning the men’s 100k by nearly an hour. There was also a 26.2 version that Lauren Coury won (2nd overall) with Zac Marion 1st in the Men. Things at AC probably speak for themself? Sieere-Zinal looks like a wild race. Top notch competition, excited to see how that one plays out.